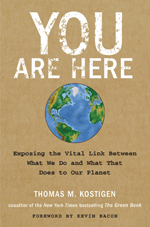 Thomas M. Kostigen is the New York Times best-selling co-author of The Green Book: The Everyday Guide to Saving the Planet One Simple Step at a Time and his newest book You Are Here: Exposing the Vital Link Between What We Do and What That Does to Our Planet (HarperOne). He has traveled the world – from the deserts of the Middle East to the slums of India; from polluted cities in China to the jungles of Borneo; from the Arctic Circle to the Amazon; as well as many other environmental hot spots – to investigate the effect of man on the planet. Kostigen, a nationally recognized expert and speaker, specializes in social responsibility issues such as the global water supply, electronic waste, energy consumption and carbon emissions. At the podium, Kostigen employs images from his world travels to powerfully demonstrate the impact of our actions. He takes people to the frontlines of the most environmentally significant places on Earth and explains how everyday actions matter. Bringing the audience with him on his adventures to exotic locales, he provides “Wow!” factoids and empowering messages, as well as the opportunities for sustainability, profitability, and natural resource efficiency. In a program that imparts an understanding of here-and-now issues, Kostigen educates audiences on the importance of their actions and leaves them emboldened to make changes in their personal and business lives. Kostigen has appeared on NBC’s Today, CNBC, Entertainment Tonight, Planet Green’s Supper Club with Tom Bergeron, USA Network’s Character Road Trip, The Sundance Channel, The Daily Green, The Washington Post’s “SPRIG,” LIME’s “The Lazy Environmentalist” and Good Company, Westwood One Radio Networks, and CBS Radio. He is also quoted widely in the national press. Kostigen writes the “Better Planet” column and blog for Discover magazine, as well as the “Ethics Monitor” column for Dow Jones MarketWatch. He has spent almost two decades exploring issues related to global warming, the environment, social issues, and governmental policies. 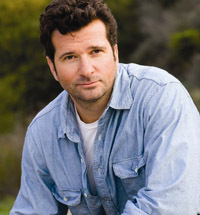 An advocate of corporate social responsibility, Kostigen regularly works with CERES (corporate environmental responsibility), Coop America, Liberty Hill, The Social Investment Forum, and other organizations that aim to shift social and environmental awareness through changes in habits and policies.